I started graduate school in 2011 to work on an MBA. About halfway into the two-year program, during a conversation I had with my father-in-law, I mentioned how difficult it was to hold down a full-time job, be a good husband and father, fulfill my Church assignments and keep up with my studies. His response was short and sweet, “If it was easy, everyone would do it” he said. That sentiment applies to many endeavors, and especially to my assigned topic today. To get started, let’s look at an example from the life of the prophet of the restoration, Joseph Smith when he was just 14 years old. We’ll pick up his story from Joseph Smith History in the Pearl of Great Price, as he explained the religious revival occurring where they lived, in Manchester, New York. But before we read about what led to the First Vision, I’d like to point out that it was not a coincidence, but by Divine design, that the Smith family lived at that time in that part of the world. Also, our lives and experiences are all part of a loving Heavenly Father’s plan for us. At the moment, we may not see His hand in our lives, but often, looking back, we can see it. And in that vein, we’re so blessed to have prophets, seers, and revelators guiding the Lord’s Church today. …I came to the conclusion that I must either remain in darkness and confusion, or else I must do as James directs, that is, ask of God. I at length came to the determination to “ask of God,” concluding that if he gave wisdom to them that lacked wisdom, and would give liberally, and not upbraid, I might venture” (Joseph Smith History 1:10-13). The Prophet Joseph had a question, something that was weighing heavily on his mind. He determined the only way he could find an answer was to ask God, and he was encouraged by James’ promise that God would answer and wouldn’t scold him for the asking. Follow the example of the Prophet Joseph. Find a quiet place where you can regularly go. Humble yourself before God. Pour out your heart to your Heavenly Father. Turn to Him for answers and for comfort. Pray in the name of Jesus Christ about your concerns, your fears, your weaknesses…. And then listen! Write the thoughts that come to your mind. Record your feelings and follow through with actions that you are prompted to take. As you repeat this process day after day… you will “grow into the principle of revelation” (President Nelson). Is this time in which we live so different from Joseph Smith’s time? We live in a modern, technologically advanced, global culture, yet all of us, from time to time, still struggle with questions of the heart or matters of eternity. We, or those around us, may ask: Where did I come from? Why am I here? And where am I going after this life? We may also have questions like: Does God speak to prophets today? Is the Book of Mormon true? And, what difference does it make if I pay my tithing, fulfill my calling or attend the temple? In our home, our 16 and 12 year-olds have posed questions like: Why do I need to go to church (or seminary)? Why do I need to wear a white shirt and tie to pass the sacrament? And, why does it matter if I don’t go to mutual? I’m sure most of us can relate to these questions from one perspective or another. For each one of us, we’re forced to either find answers to our questions or, as Joseph Smith explained, remain in darkness and confusion. No challenge is overcome by wishing, but by acting and doing and persevering. For example, we purchased a new home here in 2013. As much as I wish the landscaping was done, it isn’t done unless we do it or hire someone to work on it. I can plan and wish and dream all I want, but without effort, time and money, it doesn’t get done. Life’s sincere questions require persistent pondering. There’s a reason we’re taught to search, ponder and pray. Just like the recipe for my favorite black forest cake, the recipe for receiving personal revelation has many elements, and with quality ingredients, in the right amount, the result is delicious. The power that comes from pondering is the power of revelation. What do we search to find answers to difficult questions? I suspect the first thought that entered many of your minds is Google. And, in fact, I think Google is a great tool for a happy marriage. Perhaps it’s worked for you like it’s worked for me? Whenever there are disagreements, a quick Google search resolves the issue and you can move on. It’s miraculous. Seriously though, we know where we should look to find answers to life’s difficult questions. We look to the scriptures and words of living prophets and Church leaders. Never at any time have God’s children had access to His word like we do today. We carry in our pockets and purses more gospel knowledge and resources than the pioneers could pack in a covered wagon train. We live in the dispensation of the fulness of times, with the fulness of the restored gospel of Jesus Christ, and in the information age with an explosion of news, media and entertainment. One of Satan’s greatest tools in our time is information overload. All he has to do is distract us, so we wander from one thing to another and are tossed to and fro and carried about by every trending story or movie. I suggest that there’s a good recipe or formula, we can use to search, ponder and pray and receive important personal revelation. Let’s turn to the last section of the Doctrine and Covenants — a vision given to President Joseph F. Smith in Salt Lake City in 1918. This revelation was the result of President Smith’s sincere pondering. World War One was raging, and the influenza epidemic was spreading across the globe. Many families were mourning the loss of loved ones, including President Smith who, ill himself, suffered the loss of his eldest son due to an illness earlier that year ( Robert L. Millet, “The Vision of the Redemption of the Dead (D&C 138),” in Sperry Symposium Classics: The Doctrine and Covenants). While I was thus engaged, my mind reverted to the writings of the apostle Peter, to the primitive saints scattered abroad… where the gospel had been preached after the crucifixion of the Lord. As I pondered over these things which are written, the eyes of my understanding were opened, and the Spirit of the Lord rested upon me, and I saw the hosts of the dead, both small and great” (D&C 138:1-11). We sit in a quiet place, free from distractions. We study the scriptures and words of prophets because they connect us to heaven. We have a desire to learn rather than just finishing a chapter. We ponder, meditate and reflect. We think deeply about what we’re reading. We consider it and think about it again and again. We engage our mind and heart in an active process. We pray and listen for the influence and input of the Holy Ghost. And finally, we write down impressions received and actions to be taken. We’re talking about an active, not a passive activity. Most often, we have to be actively engaged and take deliberate steps to receive answers. Remember how Joseph Smith reflected on James 1:5 again and again? It wasn’t a one-and-done experience. He pondered and reflected sincerely, over and over. There’s a fine line between pondering and wandering. Unfortunately, some of you may be experiencing wandering at this very moment. You’ve heard the expression, “practice makes perfect?” Every week we have a perfect opportunity to practice pondering when we partake of the sacrament. We know what the sacrament prayers will be. We can memorize them. We can read, study and ponder them. We can follow all the steps I just outlined each Sunday as we partake of the sacrament. We have to be disciplined to avoid the opportunity for distraction. If we do, the ordinance of the sacrament will bring us closer to Heavenly Father and help us claim the enabling power of the atonement. Each week, it will activate the power of faith and repentance in our lives. In addition to partaking of the sacrament, we engage in personal scripture study. Studying scriptures is better when we allocate a specific amount of time to the activity as opposed to quickly reading through a certain number of verses or chapters. It’s also best done when we can sit, not lie on the bed or couch, and be free from distractions, including responding to smartphone alerts — which could easily be identified as today’s most significant distraction. President Hinckley said: “As we learn to love the scriptures, they not only nourish us; they become delicious to the taste” (President Hinckley). When I was 19 and a new missionary in the MTC in Provo, I experienced what it was like to hunger and thirst for the scriptures. I recorded in my journal how much I loved reading the Book of Mormon. It felt like a Thanksgiving feast for the soul. We can think of it this way: scriptures fill our minds and hearts with quality ingredients the Holy Ghost can use to teach and instruct us. Studying scriptures opens the door to personal revelation. Working diligently to find answers to gospel questions and receive inspiration is an essential part of our discipleship and spiritual progression. It’s an integral part of enduring to the end. We should not be haphazard in our reading but rather develop a systematic plan for study. There are some who read to a schedule of a number of pages or a set number of chapters each day or week. This may be perfectly justifiable and may be enjoyable if one is reading for pleasure, but it does not constitute meaningful study. It is better to have a set amount of time to give scriptural study each day than to have a set amount of chapters to read. Sometimes we find that the study of a single verse will occupy the whole time” (Howard W. Hunter, “Reading the Scriptures,” Ensign, Nov. 1979, 64). Does this sound like a promise from the sacramental prayers, “…that they may always have his Spirit to be with them” (D&C 20:77)? The Church’s new ministering effort will most certainly require personal revelation. With the former regimented in-home visit and reporting structure of home and visiting teaching gone, each of us assigned to look after families and brothers and sisters in our wards will need to rely on inspiration as we seek to meet the temporal and spiritual needs and minister to those around us as the Savior would. We also need personal revelation to know we’re led by a prophet of God, and to follow him. Inspiration and revelation come with practice, patience and persistence. We’ve probably all heard Church leaders talk about how callings are given, through revelation, inspiration and association. In addition to the scriptures and words of Church leaders, we can talk with loved ones or others in our lives. Sometimes the Lord answers questions through the inspired words of a bishop, family or ward member, or friend. Our associations can be sources of inspiration, divine direction and guidance in our lives. The Spirit will always confirm truth and let us know when we have the mind and will of the Lord on a specific matter. Like Moroni taught, “by the power of the Holy Ghost ye may know the truth of all things” (Moroni 10:5). Often, Vickey will share insight or observations that hadn’t occurred to me. She’s usually more in-tune with spiritual things than I am, and very helpful when I need extra guidance or direction. Association is one way the Holy Ghost works, which is why reading scriptures and words of Church leaders is helpful. It fills your mind with words of eternity that can be used to provide answers to difficult questions. Revelation given to us will be appropriate for our sphere of responsibility, in our home, family, Church or employment. An excellent way to know that revelation is from the Lord is if it applies appropriately to our stewardship. …Whatever our Church calling, we can pray to our Heavenly Father and receive guidance and direction, be warned about dangers and distractions, and be enabled to accomplish things we simply could not do on our own. If we will truly receive the Holy Ghost and learn to discern and understand His promptings, we will be guided in matters large and small. Nothing opens the heavens quite like the combination of increased purity, exact obedience, earnest seeking, daily feasting on the words of Christ in the Book of Mormon, and regular time committed to temple and family history work. I promise that as you continue to be obedient, expressing gratitude for every blessing the Lord gives you, and as you patiently honor the Lord’s timetable, you will be given the knowledge and understanding you seek. Every blessing the Lord has for you—even miracles—will follow. That is what personal revelation will do for you. We study and ponder the scriptures and words of prophets. We write down impressions received and actions to be taken. I know the heavens are open and miracles happen. We are led by a living prophet who holds priesthood keys to administer the Lord’s Church. 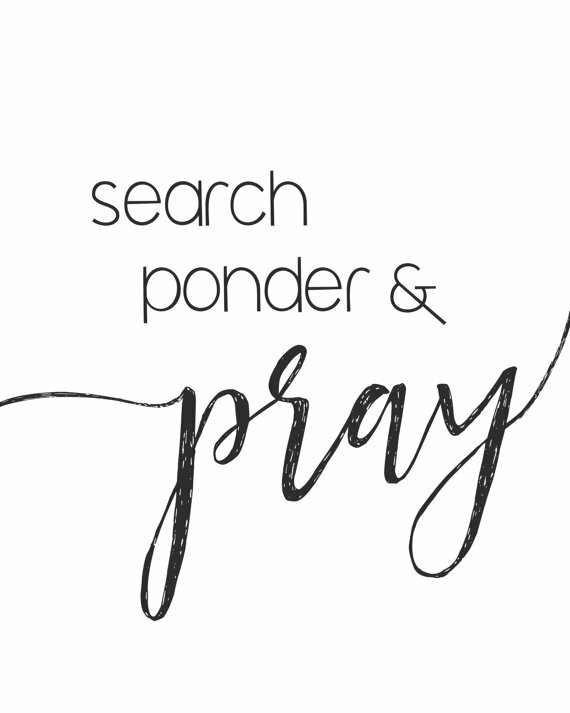 As we search, ponder and pray, we’ll receive guidance and direction from a loving Heavenly Father to help us return to Him. I know the Savior lives and loves us. One of His strongest desires is to help and guide us. It’s up to us to ask, seek and knock.